I found yet another romanticized account of the 1809 rebellion on line, this one quite lengthy, "The Tyrolese Patriots of 1809", by Harriet D. Thompson, published in London in 1859. The following chapter sets the stage for the (2nd) Battle of Berg Isel. The slackness of the peasantry of the left bank was, however, compensated by the eagerness displayed else where. The right bank was all alive with patriotic ardor, and Hofer’s summons was received with a like enthusiasm. The bold sons of Meran and Passeyr armed at his call; the peasants of Algund marched with their leader, Peter Tallguter, a man of few words and bold deeds; Schalders, which in April had mightily cooperated in the destruction of the enemy on the Eisack, sent her contingent; and Max's also, where repose the relics of the apostle of the land, holy Valentine, and Schoenna and Partschins, and Schloss Tirol, the Roman Teriolio, that immemorial seat of dominion, around which lingers the veneration of the people, and which he must hold who would lay claim to their allegiance; nor were the men of the Pusterthal wanting, those assiduous rearers of cattle, who feed upon oatmeal that they may have rye to give to their oxen; nor the bold Vintschgauers; nor the dwellers in the wild secluded valley of Groden, who speak a language of their own; nor the Sarnthalers, who came with gay red cloaks ﬂung over their shoulders, their holiday attire; the peasants of Sterzing, and the children of the ancient Brenner, brave as in the days when they checked even the legions of imperial Rome, ﬂocked also to his standard, and, the bands of Rodeneck and Kastelruther; and ﬁnally, for an end we must make, however reluctant to omit any, the patriots of Latzfons, Villanders, Barbians, and Velthurn, the last under their gallant young leader Anton von Gasteiger. The chief leaders of the southern bands were the brothers Feller of Rodeneck; Peter Mayr, the noble inn keePer of the Mahr; the ﬁery Kenmater, innkeeper of Schabs; and the warlike student Ennemoser; to these Count von Stachelburg joined himself as a simple volunteer. At the head of all stood the Sandwirth, Andreas Hofer, and by him his impetuous adjutant Eisenstecken, and the Capuchin Haspinger, all on fire with the love of God and of fatherland, whom men called the “Rothbart,” from his long, ﬂowing, red beard. These bands, forming the main body of the army, commanded by Hofer and suported by a column of Austrians under Ertl, were to direct their attack upon the centre of the enemy’s position on the Berg Isel; while its left wing, in which were nine companies from the Burggrafenamt, with some Jagers and Austrian cavalry, were to march against the Gallwiese. When the question was raised who was to head the attack, Flarer, the leader of the company from the village of Tirol, stepped from the ranks, and declared that this post of honor had be longed from time immemorial to the riﬂemen of his native lace. The earnestness with which he claimed this privilege drew tears of admiration from the eyes of many of the bystanders. The right wing consisted of above 1000 "riflemen, led by Speckbacher, and supported by a body of Austrians under the command of Reissenfels. Speckbacher extended his line from the bridge Volders to wards the Patschberg Hill, which rises below the Patscher Kofel, whose cone-like summit soars to the height of above 7000 feet, crowned with a giant tomb or altar of heathen times. Oooh, I love this piece, Peter! The cannon has a lot of details which your painting pops. The patriotic crew a feast for the eyes. It is a unique little vignette from Eureka. Until I started reading more about the rebellion, I didn't really understand exactly what it was. Love the little makeshift gun and the even more florid history is great fun! Thanks, Iain. The flowery style of the 19th century, with it's preposterously prolongued clauses and hyperbolic prose, out of fashion thought it may be in this day of brevity and emoticons, is yet an entertaining genre to read. Great looking gun and crew! Best for you, no limber! Seriously...glad to see this project of yours take shape. The Tyrolese revolt lends it self top the smaller games that you prefer, Joe, and for that ,mater, I think to classic Piquet as well. I will probably do at least one of the games with Les Grognards 2nd edition. Talk about the Heroic Moment cards! Interesting model (ballsy to make a cannon out of wood I would think...). Great bit of history too. Evidently wooden cannon were more commonly used, over a period of centuries, than we might think - obviously they are intended for a lower powder charge and infrequent use! What a lovely artillery unit! Once again a novel and intriguing addition to your project. I am interested to see how they perform on the table. Thanks! I imagine they will perform about as they did in real life - well in cover, no so well in the open facing artillery, Cavalry, and drilled troops! I never knew such a device existed!! Amazing cheers Peter. I had thought they went out in he Medieval era...but sporadic use,chiefly by insurgents, evidently persisted into the early 20th century! Great stuff Peter. I wonder where those Turkish pistols are nowadays. Hmm, a good question. I suppose it is possible that they were passed on to his descendants. After the war, his son was granted an estate by the Kaiser. A very unusual piece, Peter. I wonder if it was actually used to effect in battle? 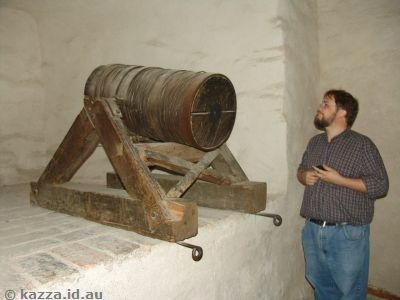 Your photo of the wooden cannon in Salzburg is unusual as well. I wonder where this was on display? I don't recall seeing such an object. The ledge it is sitting on reminds me of the architecture of the Hohensalzburg Fortress in Salzburg. I will have to check my photos and see if I captured this image when touring the fortress. I suspect they were largely used to fire a form of canister at close range. used thusly, they could be an effective anti-personnel weapon, concealed in the edge of a woods, or positioned to sweep a defile. I doubt roundshot would be able to achieve much velocity; a larger charge would be likely to breach the "barrel, and there must have been considerable leakage as well. I captured the image via Google; it was from the (rather interesting) travelogue of an Australian couple who took their honeymoon in Europe back in 2008! Beautiful little battery Peter. That gun is superb. A most interesting piece of one-sided narrative too. Evocative stuff! Thanks, James. Yes, inspiring stuff, but no retention of balance needed, eh? A fantastic looking piece of artillery. I don't think I would have liked to fire the gun. It looks as dangerous as being in front of it! You might be right, Ray!